For other places with the same name, see Tripoli (disambiguation). WARNING: As of April 19th 2019, there is an active military offensive being taken place in and around the city of Tripoli led by the Libyan National Army, any travel to Tripoli may result in injury or Death. See War zone safety for additional information. Tripoli (Arabic: طرابلس Ṭarābulus) is the capital, largest city, principal harbour and biggest commercial and manufacturing centre of the North African country of Libya. Tripoli is located in the north-west of Libya and is situated on the Mediterranean Sea. The city has a population of some 1.68 million people. Tripoli was founded in the 7th century BC by the Phoenicians, who named their settlement Oea—due to the city's long history, there are multiple sites of archaeological significance in the city and in its surroundings, not least from the period under the Roman Empire. Tripoli's prevailing climate is typical Mediterranean, with hot dry summers, cool winters, and some modest rainfall. Visas will be needed, and those can be attained via embassies or consulates. Roughly US$50-150, you should obtain the visa prior to arrival and be prepared for getting your hands on lots of information, best to ring first for the latest requirements as they change regularly. Business visitors or others with the right 'connections' may be able to arrange a visa on arrival. The cost is 100 Dinar, but the process can be slow. This must be paid in Libyan Dinar. If you do not have Dinar, you will have to go to the area after baggage reclaim to exchange some money (minus your passport). The security staff will allow you back in, but make sure they see you leave to be sure. Leaving Libya requires the right stamps in your passport. Your hotel is required to present your passport to the authorities where your visa will be stamped. Make sure you confirm this with the hotel prior to checking out or else you are liable for a fine or worse when clearing immigration. Make use of the business class lounge at Tripoli Airport (LYD 30 charge if you are not a first/business traveller) where the toilet facilities in there are clean while the same cannot be said for the ones in the general lounge. Tripoli International Airport, (IATA: TIP, ICAO: HLLT) (Arabic: مطار طرابلس العالمي), is the nation's largest airport and is located in the town of Ben Ghashir 34 km (21 mi) south of the Tripoli city centre. Prior to closure during the Libyan civil war of 2011 it served as a hub for Libyan Airlines, Afriqiyah Airways and Buraq Air. It was previously operated by the Civil Aviation and Meteorology Bureau of Libya, it is currently operating under an ad-hoc management. Prior to the outbreak of armed conflict and closure of the airport in mid 2011 many well-known international carriers were flying to the Libyan capital such as British Airways, Lufthansa, KLM, Emirates and Alitalia. Scheduled civil airline services were suspended when NATO enforced a No Fly Zone (NFZ) over Libyan airspace in 2011. Prior to this international and domestic flights were departing the airport from the main International passenger terminal. The terminal capacity was previously 3 million passengers a year. Two new terminals are to be built within the next few years bringing the total capacity of the airport to 20 million passenger movements. The first new terminal was due to open by March 2011 however the airport now requires extensive reconstruction. The radar system was seriously damaged in a NATO air strike in late August 2011. Fighting at the airport destroyed several commercial airliners and the airport infrastructure was damaged. The airport currently features one main terminal building, which acts as both the international and national terminal for the airport. The existing dual use terminal is a five-floor building with an area of 33,000²m. Check-in facilities are situated in the ground floor. Departure and duty-free shops are located on the first floor. A lounge and prayer room where previously also available in the terminal, as well as a restaurant located on the fourth floor. The Tripoli International Airport airport was officially re-opened for civil aircraft operations on 11 October 2011. Several airlines are now providing flights from the Tripoli International Airport to international destinations. Libyan Airlines and Afriqiyah Airways are providing flights to Benghazi. Mitiga International Airport. (IATA: MJI, ICAO: HLLM) is located about 8 km (5 mi) east of Tripoli's city centre. It is a public airport and was established in 1995. Scheduled civil airline services were operated to to Benghazi and Misrata and international service to Istanbul, Turkey-(Aleppo) and Syriabut but these were suspended when NATO enforced a No Fly Zone (NFZ) over Libyan airspace in 2011. The airport housed the headquarters of Buraq Air at the time of suspension of civil operations at the airport. Mitiga International Airport Prior was used by United States Air Force (USAF) prior to June 1970, it was known as Wheelus Air Base. Subsequently, the facility was known as Okba Ben Nafi Air Base, a Libyan People's Air Force (LPAF) installation. It sustained damage from NATO airstrikes and fighting between ground forces during the civil war in 2011, much of it arising from an attack on 21 August 2011 by forces opposed to the government of Libya. Turkish Airlines initially resumed limited services from Mitiga International Airport to Istanbul-(Ataturk)]] in late 2011 and then later returned to operations at Tripoli International airport, they are opening a cargo facility at Mitiga on 8 January 2012. There is no train network operating in Libya yet, although Libya is planning to introduce such a service between the east and west of the country. This is currently in the planning stages and a Chinese contractor has already been brought on board. Tourists travelling to Tripoli used to make their way there by road from Tunisia which is nearer than the other border from Egypt, the journey takes approx three hours drive from the border with Tunisia. This journey should only be completed in daylight hours as its very dangerous at night, many sheep, camels, cows, and of course shepherds roam the roads in evening and are hard to spot. There have been reported incidents of bandits operating on this route and it is therefor advisable to make others aware of travel plans. From Malta. Before sanctions were lifted in 1999 and 2003, this was the preferred method for getting into Tripoli. The only alternative was flying to Tunisia and driving to Tripoli. A new ferries line that link Sfax in Tunisia to Tripoli 3 times a week is operated by [GTT Feries] , the one way trip cost about 30$ and take 10 hours at sea. The best way to see Tripoli is to walk, there are plenty of great guides out there (books) to help you out and also you may come across some half-useful Libyan versions. The people are friendly and very inquisitive. But be aware if you're a westerner, or stick out like a sore thumb compared to a local. Don't walk around at night alone. Taxis are also useful but can be pricey for westerners. The Assaraya al-Hamra, (the Red Castle), a vast palace complex with numerous courtyards, dominates the city skyline and is located on the outskirts of the medina. There are some classical statues and fountains from the Ottoman period scattered around the castle. The Gurgi and Karamanli mosques, with their intricate decorations and tilework, are examples of the artistic skills of local craftsmen. Just outside the Gurgi mosque is the Arch of Marcus Aurelius, the only surviving Roman monument in the city. More and more palaces (especially from the Karamanli period) are also being restored and opened to the public. The basic street plan of the medina was laid down in the Roman period when the walls were constructed as protection against attacks from the interior of Tripolitania, and are considered well planned, possibly better than modern street plans. In the 8th century a wall on the sea-facing side of the city was added. Three gates provided access to the old town: Bab Zanata in the west, Bab Hawara in the southeast and Bab Al-Bahr in the north wall. The city walls are still standing and can be climbed for good views of the city. The Bazaar is also known for its traditional ware; fine jewellery and clothes can be found in the local markets. The Jamahiriya Museum, a fine modern facility located in the Red Castle, is Libya's national museum. It houses many artefacts from the country's Roman and Greek periods, including treasures from the World Heritage sites at Leptis Magna and Sabratha, as well as politically motivated displays such as the Volkswagen Beetle car driven by Gadaffi in the 1960s. Martyrs' Square, formerly known as Green Square. Prior to the conflicts of 2011 the city had a reputation as a good place to escape from the pressures of today's modern life. It might pay to wait until things have returned to some sort of normality before venturing out and about but there are wonderful beaches within driving distance, and the Old City and the Museum are good for hours of exploration. Adventurous types might try the nightclub on the 3rd floor of the 3rd building in the downtown tower complex. Like any proper nightclub it only opens at 11PM. A non alcoholic beer will set you back a small fortune, and, like in Italy and Paris, there is a charge to sit at a table. There are a few gyms scattered throughout Tripoli - there's one downtown off of Omar Mukhtar Street that has fairly comprehensive free weights and aerobics classes. Also, the Sultan Gym located off of Gorgi Road has an extensive free weights section, as well as a women-only section. All the 5-star hotels in the city have gyms with membership options ranging from LYD 200-300 per month. Ein Zara Physiotherapy Centre, Offers massage and all the basic fitness equipment for a far cheaper price of basic 75 LD/month or about 130 LD /month including massage. There is also a rumour of a gym in the Imad Complex (the 5 towers - downtown commercial area). Most jobs for expats in Libya are in the oil and gas industry although there are major plans for development of practically every part of the Libyan infrastructure. This includes rebuilding roads, airports, a new railway system, towers and offices in the commercial district, and tourist projects near Tripoli and the Egyptian border. Because of the perception that Libya offers very little compared to other Middle Eastern countries (and which is mainly true ....at the moment), and the fact that rates are generally better elsewhere such as Qatar or UAE, very few expats actually come to Libya and construction and engineering companies are desperate to attract people with experience. Libya is changing rapidly though and there are already plans for the usual big shopping malls and big brand shops and supermarkets to open in Tripoli. As a note, the government generally owns the land, not individuals, so when the government agencies want to clear a patch of ground in the city and build something, they go right ahead and do it. You might wake up one morning to find a block of houses has been cleared nearby. Doing business in Libya can be frustrating and there are many false leads. There are many stories of outside companies not being paid the full amount they are due for a project, especially the final invoice. Libyans are generally well educated and many can speak reasonable English. However, they still have a long way to go when it comes to the commercial aspects of business. Beware of the bidding process for example, if you submit you technical bid for a project and which receives the best score, and then have the best price to go with it, don't celebrate just yet. All too often, the client will now ask you again for you to come back again with your "best price". If there is a Libyan company competing against you, they may already have it wrapped up. Libya is embarking on an economic diversification project. However, they have learned from the mistakes of Dubai, and western expats will not find it to be a place they can abuse, and act in a manner that insults the local religion and culture. There are some big brand shops present in Tripoli, Marks and Spencer, Mango, H&m. Prices are similar in comparison to the UK. Clothes The best clothing shops are generally near Green Square and running up towards the former cathedral. Bargains can be found here including shoes and the usual knitwear which appears to good quality. Also in Gargarish and Benashour area there are many of nice shops. Furniture Gargarish Road running towardds Hay Andulas is easily the location to go for any furniture or office equipment, printing supplies etc. The quality of food in Tripoli is good and generally inexpensive by western standards. Do not expect a huge variety, the cuisine is mostly Arabic. The chances of getting food poisoning is slim but beware of the fish, if you do feel inclined to sample the fruits of the sea, just take one look at the cleanliness of the harbor and the beaches. There is an Oriental restaurant in the Corinthea hotel and another one in Gargash. Brush up on your Arabic; waiting staff speak little English and getting one of them to serve you at your table can be a challenge. There are several cafes and bistros in Tripoli, mostly located in the Gergaresh strip all the way to Seyaheya. A few of the most popular venues are ; 02, W Cafe, Veranda, Caracalla, Cacao, Halaweyat Sharkiya and Caffe Casa. Most of these cafes are also restaurants and serve a variety of dishes both western and middle eastern. All are popular amongst the foreigns of the city of Tripoli. Alcohol is forbidden in Libya. It is not available in any restaurants or hotels except black market which may be much pricier than you thought. Fines if caught are hefty. Please carefully consider any potential accommodation options, some facilities may have been damaged during the conflicts of 2011. You can assist the Wikitravel project by updating any listings current prior to the civil war of 2011 as they may now be inaccurate. Nouzha Hotel, Abu Gfifa St, Benashour, ☎ +218 21 3601237. 14 well kept rooms. Its size makes it more of a guest house and it seems to be very popular with longer stay foreign workers who prefer a homely touch. 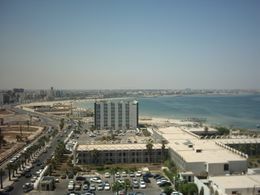 Rixos Al Nasr,  opened in 2010 and offers the best accommodations and service in Tripoli. The spa features a full Turkish bath, steam room, sauna, ice room and indoor pool. There is a beautiful garden where visitors can enjoy outdoor dining and after-dinner shisha. The Rixos was previously a place to "see and be seen" and meeting place for the local and international elite of Tripoli. No doubt it will rise again following the revolution in October 2011. The Radisson Blu Al Mahary, , opened in 2009 and still in first class condition in 2012. It has excellent rooms, restaurants, spa facilities and meeting rooms. This is not a cheap hotel - expect to pay $260 per night. Al Waddan Hotel, , was renovated in 2009 and has a "boutique" feel . Good service, rooms and restaurants. Spa facilities are adequate, along with a beautiful, private outdoor pool. Corinthia's Bab Africa, (downtown Tripoli), . Tripoli's first premier hotel, referred to locally by the chain name (not the hotel name), also a main meeting point for many foreigners and the Tripoli elite. It has a number of good quality restaurants as well as a gymnasium, indoor pool and sauna. Thobacts Hotel, is probably the 5th best hotel in Tripoli. Granted there is a big difference between it and the nearby 5 star hotels mentioned above, but it is a fraction of the price. It has been renovated and the staff are very friendly and speak Good English. Internet and wifi services were previously available but of an erratic quality. If you are on business this can be frustrating but for the leisure traveller it should not cause you a problem. Many foreign missions in Tripoli remain closed or have very limited consular services available due to the civil war hostilities. The Venezuelan embassy was ransacked and looted by rebel forces and others including the UK embassy were also damaged. Many parts of Libya are currently under the de-facto administration of the National Transitional Council (NTC), other parts of the nation have either no administration or are getting by with individual ad-hoc arrangements. If requiring assistance from your nations consular representatives whilst in Libya it may be possible to seek them out in a country adjoining Libya or from a partnered nation if a citizen of an EU state. Some foreign representation may also be available in the city of Benghazi. Please see the Contact section of the main article on Libya for more information. Below are some useful contacts, with fax and phone numbers and email addresses. NOTE: Libya was in a state of domestic turmoil after the 2011 revolution. Though more stable now, visitors should be aware of the risk posed by demonstrations and some of the remnants of armed militias. Always check that your proposed itinerary is safe with knowledgeable locals. Women may choose to dress modestly - long sleeves and long skirts or pants are considered most appropriate when shopping or sightseeing. Roman Ruins of Sabratha and Leptis Magna are worth visiting. Sabratha is towards west of Tripoli and Leptis is to the east. This page was last edited on 19 April 2019, at 16:19.